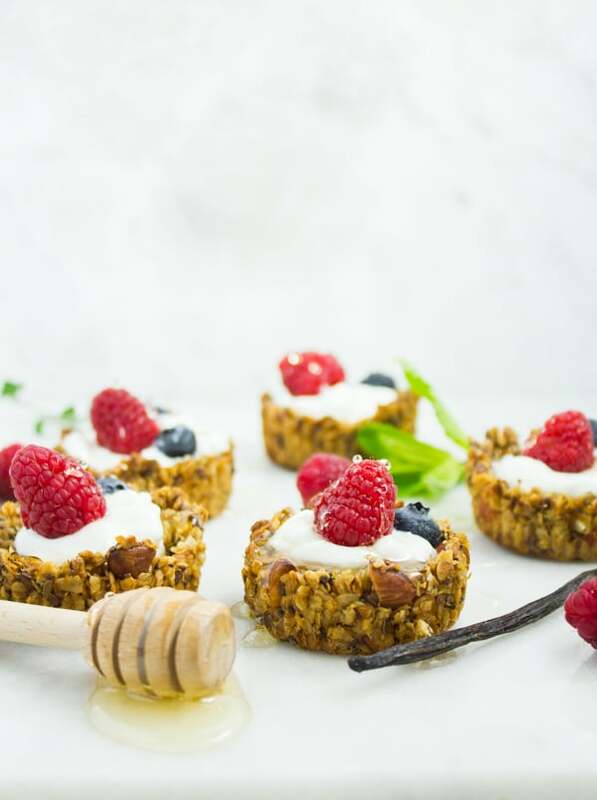 What better way to start your day than with these cute homemade Breakfast Granola Cups filled with creamy Greek Yogurt and topped with your favorite fruits and nuts! A healthy yet decadent breakfast treat your whole family will LOVE! 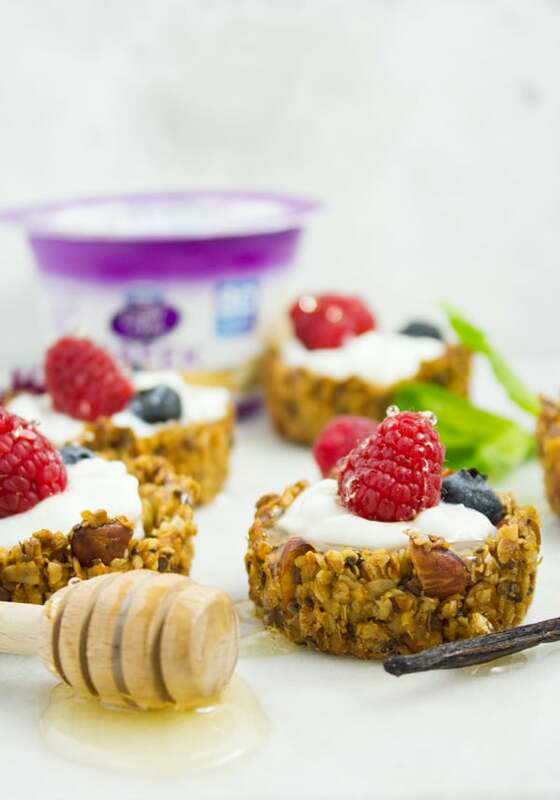 They say a healthy breakfast is the best start to the day, and this Healthy Breakfast Granola Yogurt Cups Recipe is really the perfect way to start your day! It’s the combo of almond, vanilla, honey and superfood seeds granola with decadent healthy Greek yogurt and berries. There’s a bunch of reasons why I love Greek yogurt, but I’ll admit the absolute definitive reason is that my pickiest eater LOVES it! Maybe it’s a crazy and silly mom logic, but it’s totally legit. So hello, Greek yogurt we love you! We love you for breakfast, as a healthy snack and for the fact that you be incorporated into desserts and baked goods or serve as a dessert like filling for my healthy homemade granola cups. I love how a nice fruity velvety smooth protein-packed Greek yogurt can be just as satisfying as dessert! And with the Holidays coming up, you need a backup treat to get you through some sweet temptations! 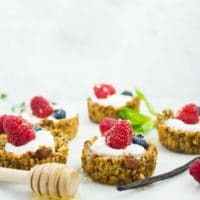 For me, one of these Healthy Granola Cups is ALL I need to get through a dessert craving when I shouldn’t have dessert. 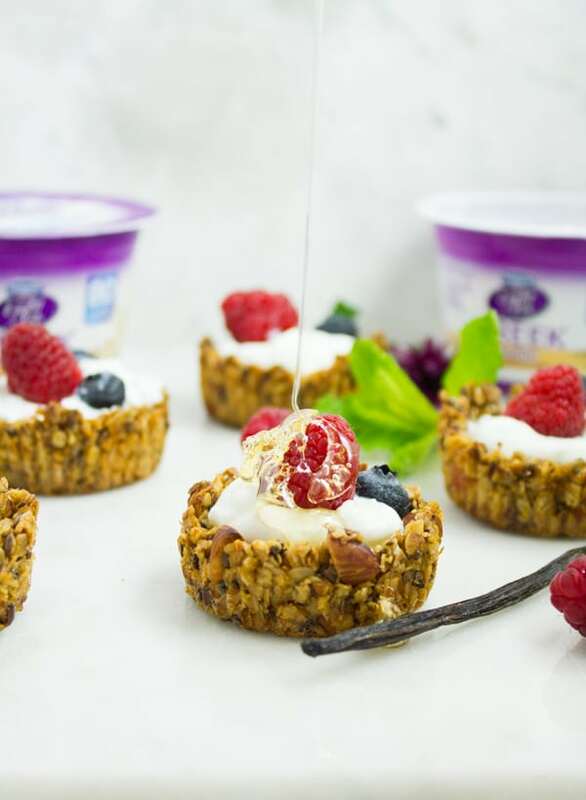 And not only that, I feel GOOD after having these yogurt filled granola cups. They’re packed with protein, calcium and Vitamin D.
It’s the same concept of granola + yogurt, but it’s a bit more personal and wholesome. It’s also great for a crowd, and can be prepared well in advance..plus it’s SUPER easy and quick!! 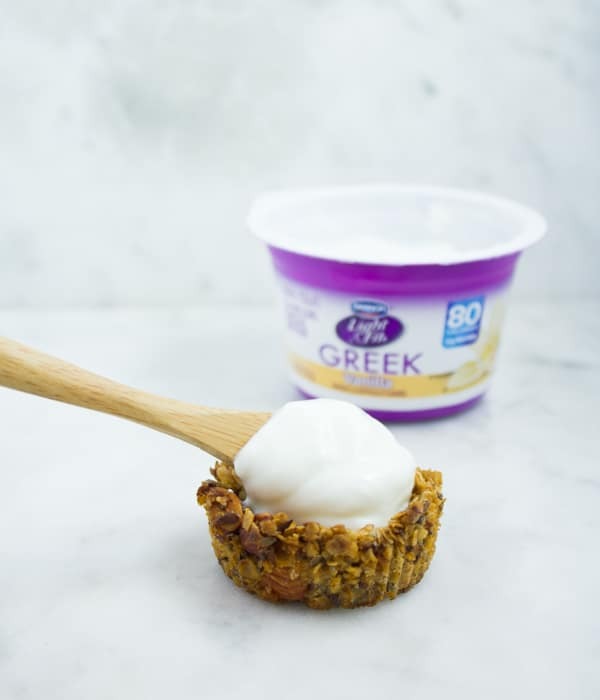 The contrast of velvety smooth yogurt and crunchy sweet granola is unbeatable, and I love the mini individual serving, plus the varieties of yogurt flavors and fruits you can use is endless! For my granola mix, I use a combo of oats, chia seeds, flax seeds and almonds for my base. Here you can add any other type of nut, or shredded coconut, dried fruit, quinoa flakes, puffs, anything goes well here! The most important thing is to keep the ratio of these base dry ingredients always the same to the wet ingredients. For the wet ingredients, I use honey (maple syrup or brown sugar is great too), oil (coconut oil is a great substitute! ), vanilla (any spice can be added here too) and egg whites ( to bind the cups—or you can use mashed banana/applesauce here too). Once you mix all the granola ingredients, you’ll place a tablespoon and a half of it into each cavity of a standard size muffin tin. 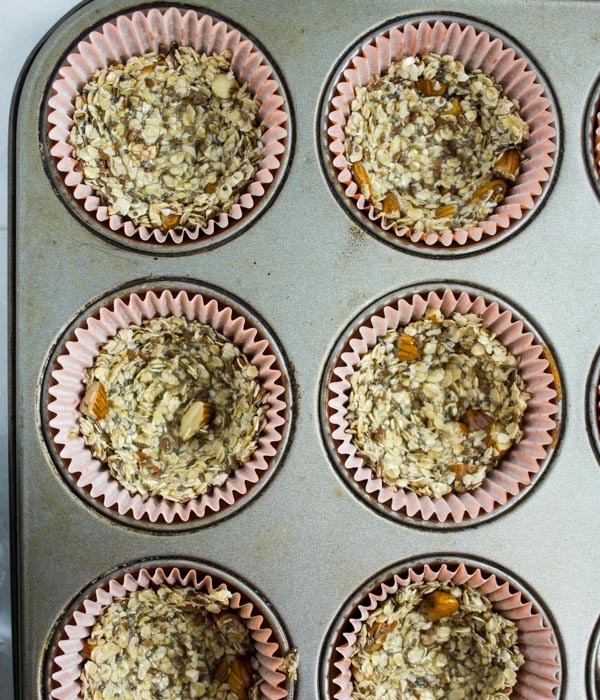 They’re super cute in a mini muffin pan too—just use a teaspoon only of the granola mix. You’ll notice I lined my pan with baking cups—because yes the granola is quite STICKY and you don’t want to risk it sticking to the pan. So I would strongly suggest you do the same. And make sure to use the tablespoon (or any spoon) to press down the granola mix at the centre so you have a nice dent and so it looks like a cup. The granola cups bake for 18 mins until golden and crispy. It’s always best to let them cool completely before attempting to remove the paper from them—again they’re quite sticky. Once these granola cups cool down, they become nice and crunchy. Now your healthy breakfast is ready for assembly. Dollop a tablespoon of your favorite Greek Yogurt in the middle and top with any fruit you love! I used raspberries and blueberries. 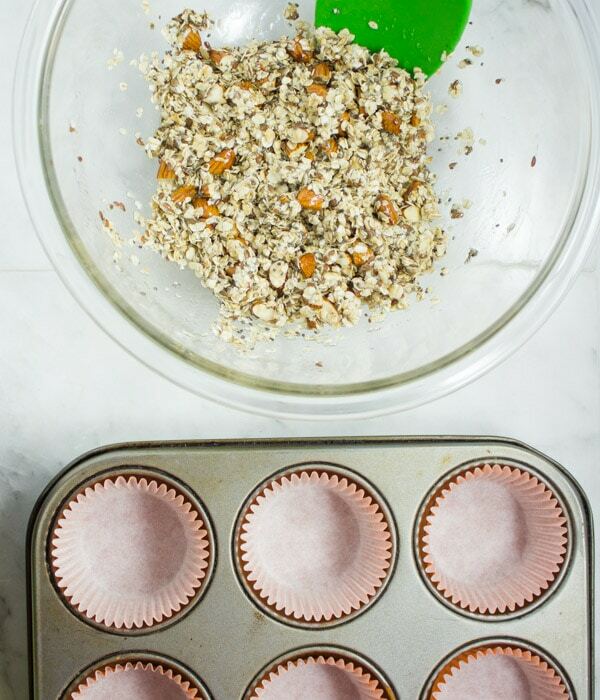 Make sure to press the granola into the molds of your muffin tin really firmly so that they hold together once baked. Pack it really tightly with no holes whatsoever. 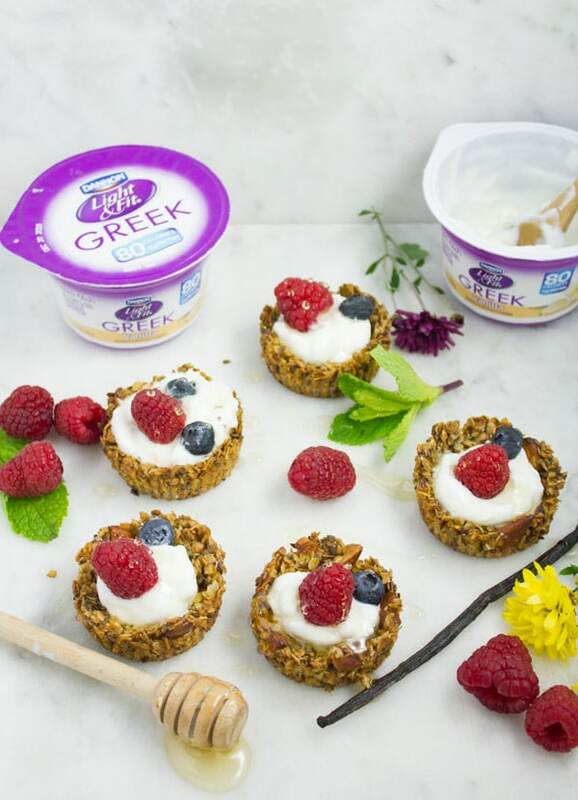 Finish your granola cups off with a drizzle of honey on top of your Greek Yogurt for showstopping presentation. Sprinkle some chia seeds on top for extra crunch and omega 3 and 6!Add any crunchy topping like nuts, chia, popped quinoa etc. 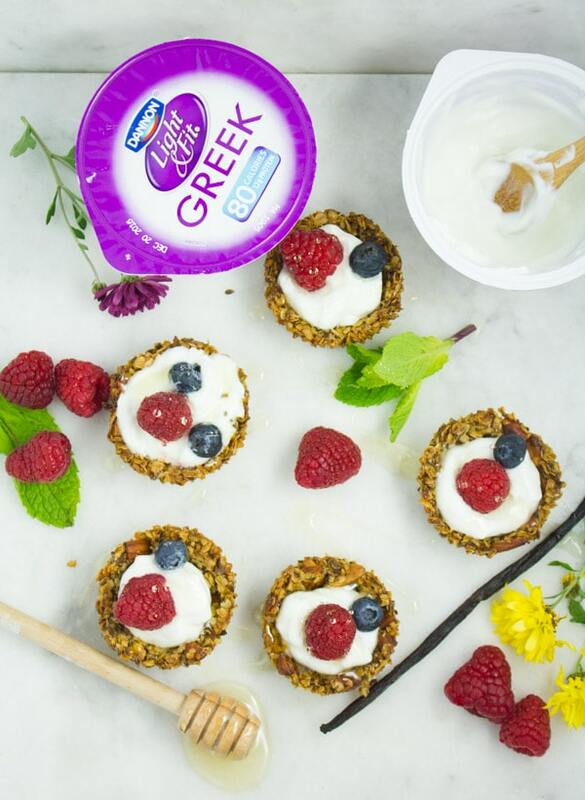 What better way to start your day than with these cute homemade Breakfast Granola Cups filled with creamy Greek Yogurt and topped with your favorite fruits and nuts? A healthy yet decadent breakfast treat your whole family will LOVE! berries Nuts, more seeds, honey..
Preheat the oven to 400 degrees F. Line a standard muffin pan with baking cups and set aside. In a large bowl mix the base ingredients for the granola cups (you can alter them adding any other ingredients such as coconut flakes, nuts, dried fruits, but keeping the total ratio the same to the wet ingredients). Add the wet ingredients to the bowl of base ingredients and mix using a spatula. 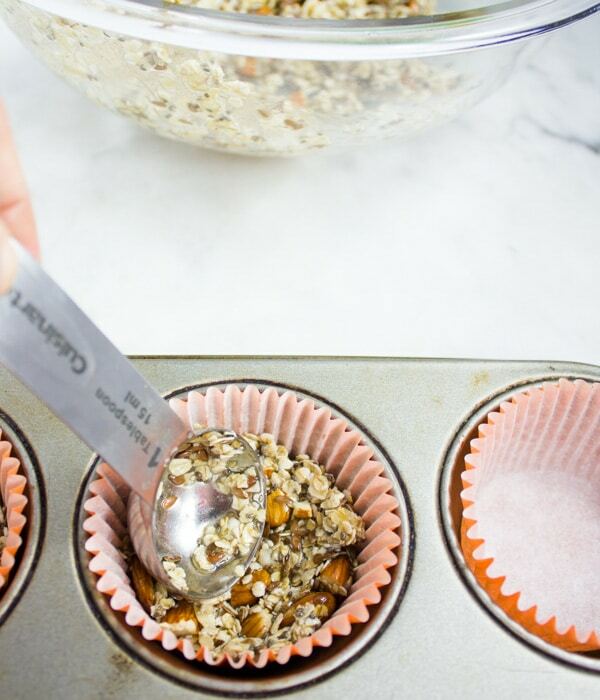 Take a tablespoon and half of the granola cups mixture and place it into each paper-lined muffin cup. Make sure to press down the mixture firmly in the middle to create the cup shape. Bake the granola cups for about tablespoon mins and then take them out to press down the centres again using the same tablespoon. return the granola cups to bake for 6-8 mins more until golden and crisp around the edges. The cups will harden and crisp up more as the cool down. Once cool completely, carefully remove the paper cups and serve the granola cups. Yum! Breakfast for the next week has been decided! I’m thinking some raspberry preserves and sugar-free chocolate syrup might just make an excellent topping! Thanks Jolene! That would be really amazing! YUM! Hi! There is a typo in the cooking time in step 5. How long is the first cooking time? Louise, sorry, that was 10 minutes!